Phew! It looks like I am going to make it! Through my first week back at work...HA! I've spent most of this first week staring at workflow diagrams trying to remember what I was supposed to be up to. Oh, and missing my sweet little babies, who were shut in at home with far too much energy. Todays project is a couple of tags that I whipped up. So, on the left, I was suffering the recent snow we had this past weekend. And on the right, I'm dreaming of Jupiter Beach in Florida, where the sea turtles winter. I'd like to be on the beach, soaking up heat and sun, letting the sand warm my toes. Only one more day, my friends, and we can say adios to the first week of 2013! How is your first week of 2013 shaping up? I'm sure it will be even BETTER if you were to win a couple itty bitty stamps from Unity, right? So, be sure to leave me a comment so you have a chance! LOVE these!!! The backgrounds are gorgeous and love that whimsical under the sea them...so cute! I love making tags because you can make a design in no time. These are fabulous and fun! Great background, did you use Distress inks or paint? Great tags! Can I join you on the beach? I've never seen a sea turtle in the wild, but would LOVE to! I want details on the backgrounds of your tags. What did you use? Beautiful tags, what great layers of color and depth you got on the backgrounds! What a great idea... for every wintry creation, a hot-weather one! I may have to adopt that. :P Love the gorgeous backgrounds you've created, too. I am so with you on wanting to be somewhere warm and sunny!! Loooove the backgrounds so vibrant..can I ask how you made it? Love your tags! They are so fun! 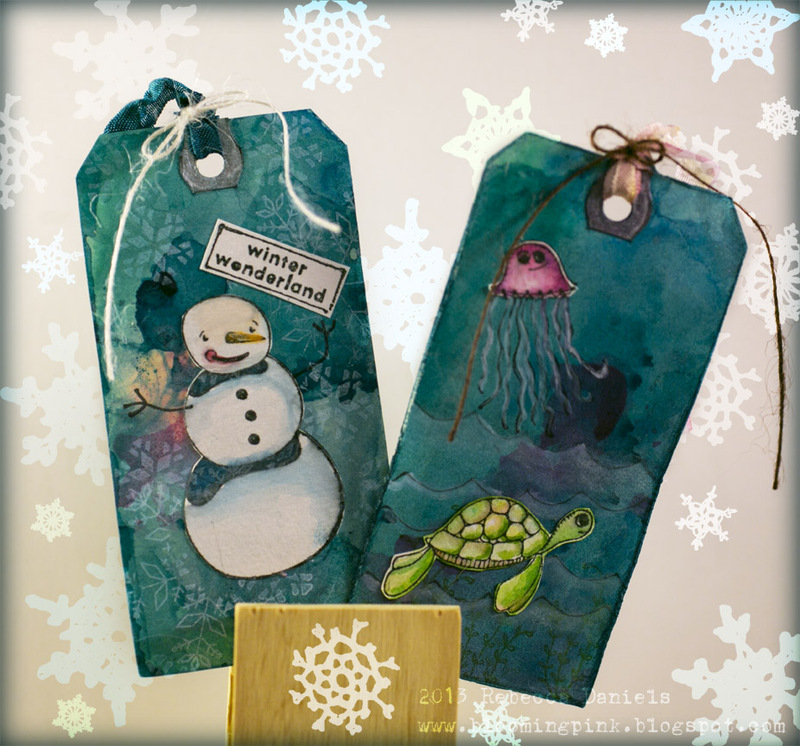 Love your tags and the spectrum from snow to sea! I love the tags. The background is so darned cool. Such a pretty tags! Love the sea one. Thanks for the chance to win! rebecca, love how you used the same background color to showcase the two different seasons. Both tags are perfecto. I am in awe over the darling color on these tags. Beautiful job on both! Love the tags. I like all the colours that you have used. I have enjoyed viewing your work and the blog. What colorful, great looking tags you made. I like the turtle. What a cutie. I'm fascinated with the way you've created a winter scene as well as a summer scene with the same fabulous color scheme! With the brutal cold temps here in PA today, I'll dream of Jupiter Beach FL with sand warming my toes too! Great tags! Happy New Year too! Love the colors on your tags! Great job.... that snowman is adorable!